New record has been registered in solar family. It is proved that a volcano on Mars planet is the biggest volcano in the solar family. Its name is Tharsis Rise. Biggest volcano means not in terms of height. It meant that it occupies more space. A volcano named ‘Olympus Mons’ of Mars planet is known as having greatest height in the solar family. It is considered as the biggest volcano also. Now its pride has been taken by Tharsis volcano. Olympus Mons has a height of 24 kilometers whereas Tharsis has a height of only 10 kilometers. But space occupied by Tharsis is much more. Its area ranges around 7000 square kilometers. Not only that, it is now detected that Olympus Mons was a part of this volcano. We know that Mount Everest is the tallest mountain on the earth. Its height is 8,850 meters i.e. ranging in between 8 and 9 kilometers. Comparing with Mount Everest, Olympus Mons is taller than it by 3 times. 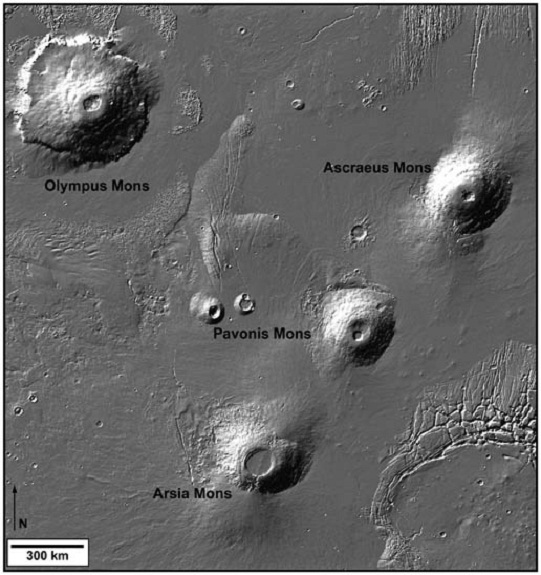 As this much tallest Olympus Mones is a part of newly discovered Tharsis, we can estimate how big will the Tharsis be? Age of Tharsis is believed to be more than 300 crore years. We know that volcanoes are formed due to the release of lava. If areas at which volcanoes form, are tough with hard stones then lava that comes out accumulates up on that hard ground gradually, forming a volcano. If the ground in that area is sluggish in nature, then lava expands in side ways and occupies huge area. Volcanoes are there not only on the Mars but also on the other planets. More volcanoes are there on Jupiter planet. But there is an estimation that more than 10 lakh volcanoes are there on it. Volcanoes are also there on sub planets. Volcanoes will be formed even on Moon also. Volcano’s surface will be covered with Sulphur ash of 100 meters thickness.